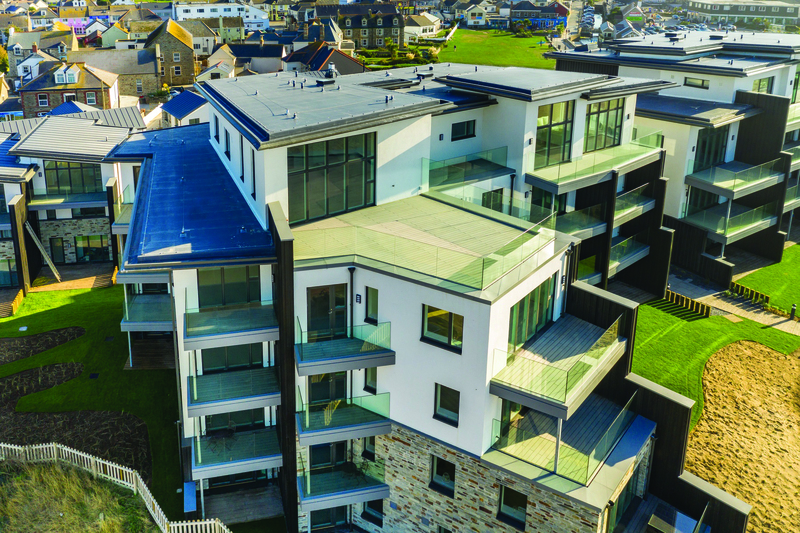 The Dunes, a stunning new beachfront development in Perranporth, Cornwall, has seen a combination of Sika products used in order to create a durable solution for the roof and balconies, able to resist the difficult coastal weather conditions. While the beach setting provides the 36-property development with a spectacular backdrop, it also presented many challenges due to a problematic climate. With the roof and balconies needing to guarantee a long-lasting result, Sika Sarnafil and Sika Liquid Plastics systems were specified for the job, working together seamlessly to create the desired result for the project. Progressive Systems, a leading roofing contractor in the south west, was tasked with carrying out the installation. Having worked with Sika before, they suggested Sika Sarnafil single ply membrane for the roof, as the adaptability of the material would be durable enough to resist the elements, with a look to equal the prestigious coastline location. Wind uplift calculations were provided by Sika Sarnafil to the contractors, which suggested the product be mechanically fixed to ensure the roof was able to resist the formidable weather. With a combination of Sarnafil’s S327 18 EL Lead Grey single ply membrane, plus Sarnavap vapour control and SarnarTherm insulation, the outcome was a robust roof that met the requirements of the project. For the balconies, a Sika Liquid Plastics system was suggested to provide a complete watertight solution. With the installation handled by Western Flat Roofing, a Sika Liquid Plastics’ Quality Assured (QA) contractor, they chose to use Sikalastic 625 grey (PU), cold applied system with self-adhesive on a tapered insulation scheme, creating seamless and durable waterproofing on the balconies. The project and its location presented many opportunities to problem solve for both contractors and Sika. When installing Sarnafil’s single ply membrane health and safety was top of the agenda – in fact, the disruption caused by strong winds even resulted in aborted site visits on occasion. On the balconies, the installation of three-ton hot tubs meant the insulation scheme had to be designed to allow water flow around the fixed structure, while complying with the correct U-value and withstanding the weight. However, regular visits from Sika’s Field Technicians meant queries were handled directly and quickly resulting in a successful installation and securing a 20-year guarantee for all Sika products used. The coastal conditions will be no match for the resilient solutions created by Sika, expertly installed across the roof and balconies to keep the residents of The Dunes warm and dry for many years to come.